Sunday December 11th 1921 Went to church and out for dinner. Later called on Mrs George Watkins and daughter. Mr Miller brought us home. [Maurice?] Reed called. We went to church in the evening. weather nice. Monday December 12th 1921 The forenoon was short. We went to dinner early. The girls both went to the depot with me. I left at 3.10. When I reached Chillicothe it was raining. Went up in a taxi. Tuesday December 13th 1921 I ironed and wrote some in AM. Mattie down town in afternoon. I called on Mrs Tomlinson and Mrs Harmon. I had letters from Hattie, Lizzie Lindley and Miss Dorwart. 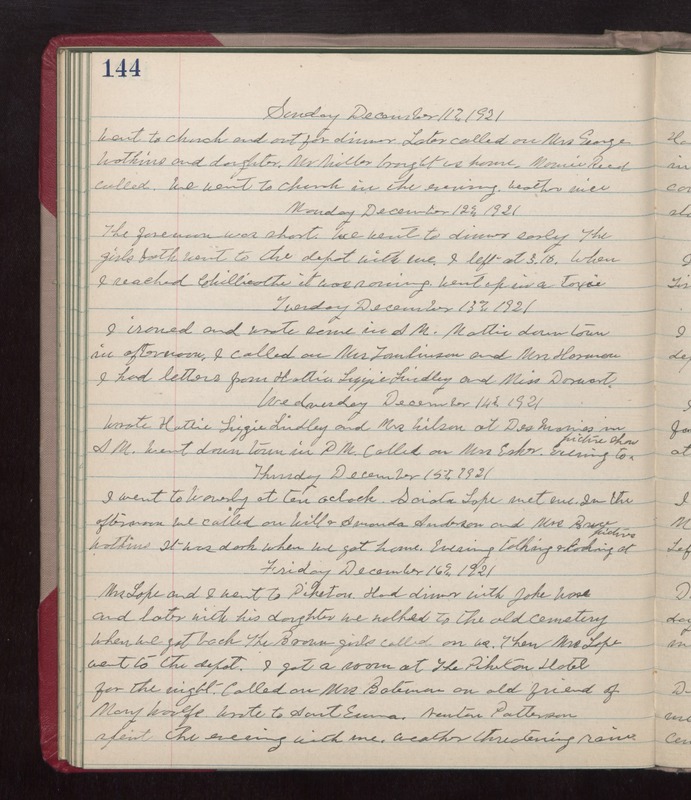 Wednesday December 14th 1921 Wrote Hattie, Lizzie Lindley and Mrs Wilson at Des Moines in AM. Went down town in PM. Called on Mrs Esker. Evening to picture show. Thursday December 15th 1921 I went to Waverly at ten oclock. Sciata Lape met me. In the afternoon we called on Will & Amanda Anderson and Mrs Bruce Watkins. It was dark when we got home. Evening talking & Looking at pictures. Friday December 16th 1921 Mrs Lape and I went to Piketon. Had dinner with Jake Ware and later with his daughter we walked to the old cemetery. When we got back The Brown girls called on us. Then Mrs Lape went to the depot. I got a room at The Piketon Hotel for the night. Called on Mrs Bateman an old friend of Mary Woolf. Wrote to Aunt Emma. Newton Patterson spent the evening with me. weather threatening rain.